Asia: Australian building material's group Boral has announced that it has completed its acquisition of Lafarge's interests in the two companies' former joint-venture Lafarge Boral Gypsum Asia. The business has been renamed Boral Gypsum Asia (BGA) and transition plans are in place for product branding in each country. BGA has performed to expectations since the acquisition was announced in August 2011. The chief executive of Boral, Mark Selway, said, "We are delighted to be able to fully integrate BGA into our group. The continued growth of BGA is a strategic priority and we look forward to working with the management team and employees to develop and execute our plans for the future." US: NASA's Mars Rover Opportunity has found bright veins of a mineral, which appears to be gypsum, deposited on Mars. Analysis of the vein will help improve understanding of the history of wet environments on the planet. The latest findings by Opportunity were presented on 7 December 2011 at the American Geophysical Union's conference in San Francisco. The vein examined most closely by Opportunity is about 1cm – 2cm wide, 40cm to 50cm long, and it protrudes slightly higher than the bedrock on either side of it. Observations by the rover reveal this vein and others like it within an apron surrounding a segment of the rim of Endeavour Crater. In November 2011 researchers used the Microscopic Imager and Alpha Particle X-ray Spectrometer on the rover's arm and multiple filters of the Panoramic Camera on the rover's mast to examine the vein, which is informally named "Homestake." The spectrometer identified plentiful calcium and sulphur, in a ratio pointing to relatively pure calcium sulphate. The multi-filter data from the camera suggest gypsum, a hydrated calcium sulphate. Observations from orbit have detected gypsum on Mars previously. A dune field of windblown gypsum on far northern Mars resembles the glistening gypsum dunes in White Sands National Monument in New Mexico, US. However the Homestake vein is the first time the mineral has been spotted where it formed. 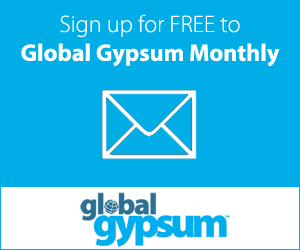 Canada: Georgia-Pacific has idled its Cape Breton gypsum mine in Nova Scotia due to the weak US dollar and low demand for wallboard in the US. The company is laying off 34 workers at the site whilst retaining eight others as a skeleton staff. Georgia-Pacific told its workers on 2 December 2011 that it will indefinitely idle operations at its Sugar Camp quarry. "This is not a closure or a shutdown; it's an indefinite idle," said company spokesman Eric Abercrombie. "This is purely a business decision to idle the facility based on the North American market conditions and the weaker US dollar." Georgia-Pacific had 73 employees in Cape Breton until the autumn of 2011. The Sugar Camp operation has been open since 1962. In December 2011 USG permanently closed the Fundy Gypsum mine in Hantsport, Nova Scotia. UK: Eastern Waste Disposal Ltd has won a Euro0.85m multiple awardees contract award from Essex County Council to provide services for the collection and recycling of gypsum. According to the description, "In accordance with its duties under the Environmental Protection Act 1990, Essex County Council sought services in relation to the collection and recycling of waste gypsum and tyres sourced from recycling centres for household waste in Essex and waste collection authority/waste disposal authority premises, including transfer stations, in Essex." The contract period will be 21 months from October 2011 until June 2013 with options for the council to extend. France: Lafarge, the French building materials giant, has announced plans to restructure the group along national lines instead of product types. The move will be implanted from the start of 2012 and was described by Lafarge as 'the natural next step' following its geographical expansion and its recent refocusing on cement, aggregates and concrete. This has become more pertinent following the disposal of most of its gypsum activities, with only North America the only area in which it still has gypsum operations. The aim of the project is to increase Lafarge's differentiation through the development of higher value-added products and solutions for construction.